I entered a giveaway at lej-jewellery.blogspot.com and was lucky enough to win. Here's my crochet piglet trying one on for size - they look way better on me though! 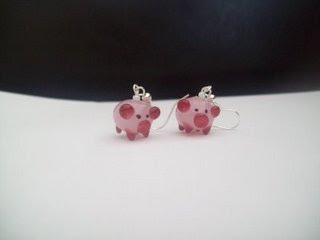 If you fancy some piggy earrings of your own (who knows, they may even protect you from the dreaded swine fever?) then head over to http://www.lej-jewellery.co.uk/ where you will also find other fun earrings such as penguins and sheep, and some more conventional items too! I like the piggies! Popping to her shop for a look..
Congratulations, they are utterly adorable! cute pig earrings!! and your little pig is very cute!! Congratulations on your win!! 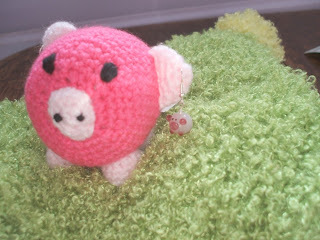 The earrings are cute and your crocheted pig is pretty cute too! Congratulations on your win! Those earrings are cute and so isn't your crocheted pig!